A report published on Monday 18 June 2012 by the London School of Economics reveals the horrific scale of mental illness in Britain - and how little the NHS does about it. Mental illness is now nearly a half of all ill health suffered by people under 65 - and it is more disabling than most chronic physical disease. Yet only a quarter of those involved are in any form of treatment. 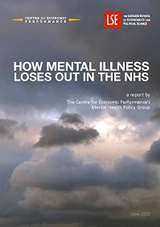 Download the report "How Mental Illness Loses Out in the NHS" by the Mental Health Policy Group - a distinguished team of economists, psychologists, doctors and NHS managers convened by Professor Lord Layard of the LSE Centre for Economic Performance. "We live in a stressful society and the number of patients with mental health problems presenting to GPs is on an upward spiral. GPs face tremendous challenges in caring for patients with mental health problems in primary care and we welcome any development which will help us improve their care. "Talking therapies have the potential to transform thousands of patients' lives and we applaud Lord Layard and his team for their efforts to extend the programme further. This would be a major step forward, not only for patients, but for GPs and other health professionals working in mental health. "GPs must have access to a range of talking therapies, from counselling and cognitive behavioural therapy to longer term psychotherapies, for the wide range of conditions that we see in our consulting rooms." "The Academy of Medical Royal Colleges welcomes this report and recognises the importance of investment in mental health services and contribution made by psychiatrists to improving health care"
"The BMA is pleased that the Mental Health Policy Group is highlighting the problems many with mental health problems face in getting access to the help they need. The BMA is also concerned about the poor physical health and early death of many with serious mental health problems, and views this as a major inequity that must be addressed. We will be undertaking more work on this area in our next session and today's report is an excellent starting point for that work." Director of the Wellbeing Programme,CEP; Director of the Mental Health Policy Group; and Emeritus Professor of Economics, LSE.